The chat on Winthier is organized into several channels, to separate what is talked about in your surroundings. 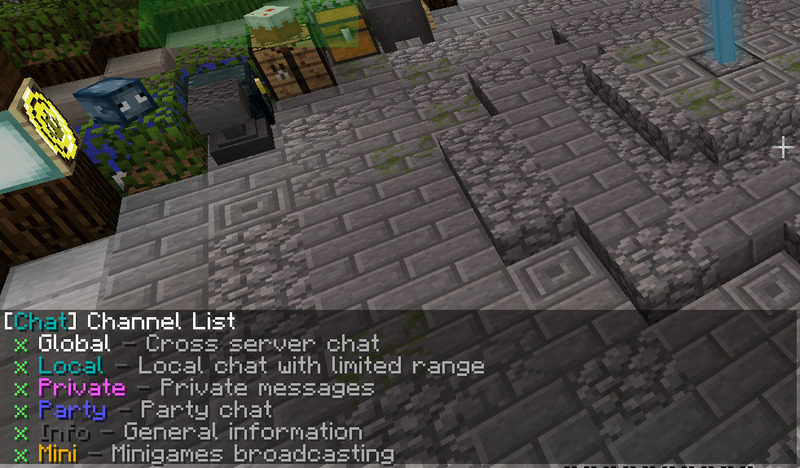 Some of the channels allow players to speak with their friends, while others display server messages and minigame information. You may join and leave each channel as you please. Additionally, you may focus on one chat channel at a time, which is where your messages will be displayed unless you specify otherwise. [G] Global chat – Everyone can hear you. [L] Local chat – Range limited by 250 blocks. [PM] Private chat – Only the player you are messaging can hear you. [P] Party Chat – Only players in your current party can hear you. [I] Information channel – System log, player death, join and leave messages. Each channel has a short abbreviation that you can use instead of the name. You must be in a channel to talk in it. In the chat menu (/ch), click on a channel to edit its settings. Joining and leaving channels, plus some additional features, can be done via commands. Like any other command, they start with a slash. Commands are very straightforward. You can replace the channel argument with either the name or the one letter shortcut of one of our chat channels. /ch – Open the chat menu. /ch list – See a list of available channels. /ch who [channel] – See who is in the channel with you. /join <channel> – Join a channel to read what people talk about. /leave <channel> – Leave a channel to have some quiet. /<channel> or /ch <channel> – Focus on a specified channel. For example, /g or /ch g to focus on Global. You can send private messages to other players and start private conversations that way. /msg <player> <message…> – Send a private message to another player. /msg <player> – Focus on the private conversation between you and another player. /r <message…> – Reply to the last person who messaged you. /r – Focus on the private conversation between you and the last player who messaged you. /ignore [player] – Ignore or unignore another player, both in channels and private messages. Leaving out the player argument gives you a list of the players you are ignoring. You can create your own chat channels for you and your friends via party chat. All it takes is a made up party name that is known among your peers. You can only be in one party at a time. /party – See which party you are in, if any, and who is with you. /party <party> – Join or create a named party. /p <message> – Talk in party chat. /p – Focus your current party. /party q – Leave you current party. /party invite <player> – Invite someone to join your party. /party accept – Accept the invitation.